Rhubarb is one of about 60 plants in the genus Rheum, family Polygonaceae. 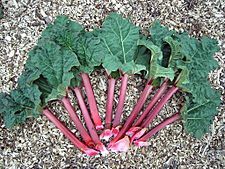 The vegetable rhubarb is Rheum rhabarbarum (or Rheum x hybridum). The leaves are toxic, but the red stalks are baked in pies, with sugar to soften their tart flavor. There are many varieties grown for eating. The drug rheum is prepared from the rhizomes and roots of another species, R. officinale or medicinal rhubarb. Rhubarb Facts for Kids. Kiddle Encyclopedia.